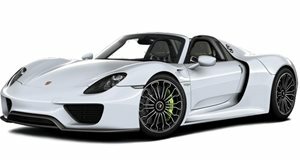 Porsche has just announced official pricing for the 918 Spyder hybrid supercar that&apos;s scheduled to officially go on sale this week. However, production will not officially begin until September 18, 2013 at the German automaker&apos;s Zuffenhausen facility with customer deliveries expected six weeks later. Production will be limited to no more than 918 examples, all of which will be left-hand drive. Some sketches of the production car have also been released, showing that it will retain the concept&apos;s profile and removable top, which is a one-piece panel similar to what was used in the Carrera GT. 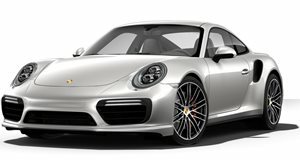 Porsche states the car will cost €645,000 ($912,868) , plus VAT. It will feature a mid-mounted V8 that will "exceed 4.0 liters" along with two electrical motors at each front axle that add at least 215 hp. This will give a total output of "more than 500 hp." The lithium-ion batteries can be charged in a regular domestic socket (a three hour charge time in Germany) and the car can travel 16 miles on electrical power alone. Porsche claims it can go from 0 to 62 mph in 3.2 seconds, a top speed in excess of 199 mph, and will return 94 mpg. Low and behold, the 918 Spyder has also given Porsche the excuse to build a new version of the current 911 Turbo. Called (it&apos;s sort of long) the 911 Turbo S Edition 918 Spyder, it will be available only to 918 buyers. Featuring 523 hp, an acid green color scheme, enhanced interior with more carbon fiber, and even a special edition plaque that matches buyers&apos; individual 918 production number, it costs an additional €173,241 ($245,188) for the coupe and €184,546 ($261,187) for the convertible.